Michael Diffenderffer, 52, was last seen at his home on the 12000 block of Ford Road in Baltimore on October 5. He left a note for his wife telling her he was going out and would be back for dinner. When he didn't return by midnight, his wife reported him missing. Michael likes to visit parks and he may have gone to one in West, Maryland or Harford or Baltimore counties. Michael is 6'2" tall, 235 pounds and was driving his silver 2005 Acura MDX. The vehicle has not been located either. 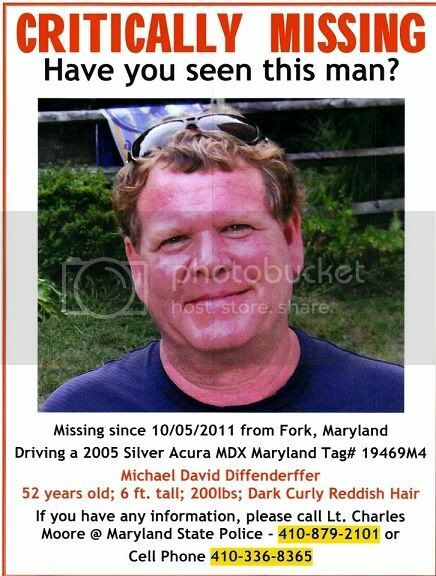 If you know of his whereabouts, or see Michael or his car, please call the police at 410-879-2101. I have a request here to look at Tarot to see if anything can be seen in respect of Michael who has been missing since October 5th. As this is a recent disappearance I am going to write for Michael first (assuming he is still missing? ) and deal with other requests that are pending as soon as possible. Firstly I want to ask that everyone reads the Important Notice that I post with each Tarot. This notice explains that Tarot can pick up all sorts of information and sometimes this can be past present or future. I cannot guarantee Tarot is 100 per cent accurate so when reading one has to remember this. Please go to other news source for factual information to keep updated with true elements of the situation. When I first looked at Michael all I keep hearing myself say is 'David' and Im calling him that instead of his real name. The first card shows me that Michael had a lot of shifting priorities. The two of Pentacles tells me that he might have been thinking about a lot of financial matters and home/work situations. Maybe he had a lot on his plate or at least things that he wanted to sort out. Perhaps he was trying to juggle priorities and just felt as though whatever he was doing he was not really getting anywhere? Did he have a work contract that was coming to an end, or was there something that was supposed to happen and did not. The Ace of Pentacles tells me that if he was 'going anywhere or had something lined up' it did not come off? Looking at the next few cards I see this being something he might have wanted to rectify and balance up his finance in his life and if there was a work problem I do seem him making quick cash. So its just whether or not he had work/finance issues? I also think that Michael might have had a health issue underlying - this could be worry or stress. On the surface of it (and Im not suggesting this is FACT) it seems to me that balancing finances and the problems of that were a bit overwhelming for Michael - was there any debt to anyone which was causing a difficult situation for him? This card might indicate that and wanting to set things straight financially to balance up his home life and other matters. I also think that he could have been looking for ways in which to do this and might even have been looking for a new job. This is how it seems to me and his plans have gone awry. I feel as though this card points North but it is reversed and can mean the opposite direction - but as a pointer I give North first. There is a little bit of water on the 2 of pentacles it might suggest him feeling out of balance by water but this could also refer to his emotional thoughts or other areas of his life. I offer these thoughts anyway as thoughts to what might have been occurring in his life. Tarot seems to inform me that Michael is North. In this picture we have a new work contract so perhaps a 'solution' to problems? I did meditate on Michaels picture and he does have greenery behind him so I am hoping Tarot is not reflecting this back to me but it seems that a decision has been made via Tarot that North is his direction at the current time. There seems to me to be a 'business'' or business building in this run of cards and applying skills to making money and life a lot better with health improved. So Im not quite sure what to make of that exactly. The Ace of Pentacles can show going on a vacation or going somewhere else to carry this out. This card is reflecting finance and one would think of names of places that might reflect 'money' or gold. I am not familiar with the area that Michael disappeared and would have to look on a Map. This is a green area - does he like gardening and outdoors I see him very connected in this way . This card has often been the card of a Gardener or Landscape worker - I am seeing him in a rural setting North . I am getting 'Rose tree' with this card which might be something symbolic but I leave it also. Asking Tarot when Michael might be found I am given the Wheel of Fortune. According to this it seems his vehicle might be what finds him as this is a travel card and I also have the number 10. Ten could be October the Tenth month, it could also be a route or a distance but offers no real direction on it so we have to go back and see the last direction which was NORTH and go from there. It seems that there will be various things that come up like links in a chain of happenings that will lead to finding him, almost like a 'lucky find'. Justice is on one side of him and the Hermit is on the other side. The Hermit card often gives us places such as campsites mobile homes, caravans or open rural spaces, hills and out of the way places. Sometimes it can describe high buildings such as apartments but this card does suggest him 'having gone off on his own' and sometimes either to see someone or to just take some time out. I would have thought that he should be found by Christmas at the latest but Im hoping it might be sooner then that. Justice can be the 'law' so it could be that the LE department find him especially with Justice as the next card and also his vehicle might come up as the way to do this. I cannot guarantee that what I have seen is correct. It is very difficult sometimes to interpret exact detail with 100 per cent accuracy and I cannot promise this. All I can do is say what I feel Tarot has given to me and hope that some of it might relate to the situation and be of use/help in some way. Tarot also gives glimpses of 'Past Present and Future' and what has been seen can fall into any of these epochs of time. Please bear this in mind when reading. This is a very brief 'overview' of tarot for Michael and I will come back and look after a month has passed if he has not been found. I have not been able to work out where on the map Michael was found in relation to his home however, he was found in October and it seems with his vehicle in the kind of surroundings that tarot was telling us about. Obviously, Tarot is not 100 per cent but it seems to me that there is a business attached to the rural surroundings and Michael was found by a Hunting Club. Michael did 'find a solution' to his problems. Tarot seemed to understand Michael had a lot of problems. He found his solution to his problems which was to his benefit. It sounds very sad to say this but that is clearly what Tarot is suggesting. I think Tarot gave some good pointers for Michael, but I am really sorry that he chose to take a way out in this way. I think Michael weighed things up and whatever was going on with him he is at peace now. Tarot does not like to discuss death and will always word accordingly as it is always on the side of the person that we ask about. It will describe things in its own way. Im satisfied that it has told us that Police connected to the vehicle stated in the tarot and also as stated in tarot Michael was alone. I am so sorry for family and friends whose grief will be heavy but this was Michaels choice however sad this may be. I extend my sympathies. A Baldwin man, who was missing for more than two weeks, was found dead from an apparent suicide in West Virginia, according to a press release from the Maryland State Police. West Virginia officers said they found the body of Michael Diffenderffer, 52, of the 1200 block of Fork Road in his 2005 Acura MDX SUV with two empty pill bottles. No other signs of foul play were detected. The officers responded to Milo School Road in West Virginia on Friday after a resident called about the SUV, which had been parked on the property of a private hunting club for about two weeks, according to the release.